On rare occasions though, I do something so monumentally (*warning, non PC descriptive term to follow, consider yourself warned) retarded that to not share it, at least in some uncharted, rarely visited internet backwater blog such as this, would certainly be a crime. 1. It was late, I was very tired, and pissed because I had already pinched one brand new tube. 2. The tire iron is coming out, not going in. 3. 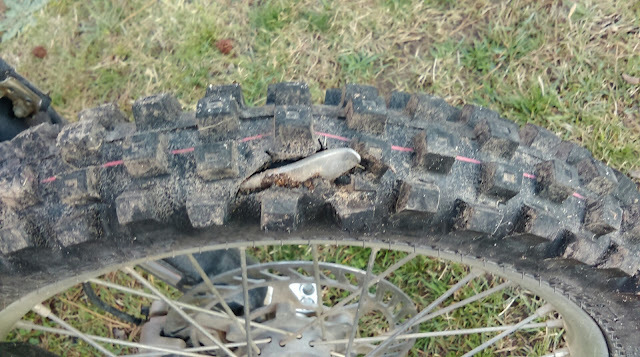 I ran a two hour race and three 1.5 hour practices before the iron in question began to make its egress (from what was essentially a brand new tire). Well Mom, if you ever needed any further explanation as to why I am not a doctor, here you go.